After months between gigs, Chloe Carter’s dishy boyfriend, Josh Driscoll, has just landed his dream job: executive chef at Simmer*,* Boston’s soon-to-be hottest new restaurant. As Josh preps for a New Year’s Eve grand opening, Chloe, on winter break from grad school, hooks him up with Food for Thought, an annual charity fundraiser. It seems like a win-win—Simmer will give the dining public a tantalizing taste of things to come, and Josh will showcase his culinary talents—until murder makes a late addition to the menu. It’s not the kind of publicity Chloe was looking for. Now wealthy club owner Oliver Kipper is dead, bludgeoned to death. The murder weapon is a state-of-the-art professional-grade food processor that, unfortunately, belongs to Josh. By opening night, the list of suspects, including Josh’s ex-girlfriends, is almost as long as the line to get into Simmer. Suddenly, Chloe’s risking her life to unmask a killer in a town where murder is becoming an acquired taste. This ebook features mouth-watering recipes sure to satisfy more than just your appetite for crime. 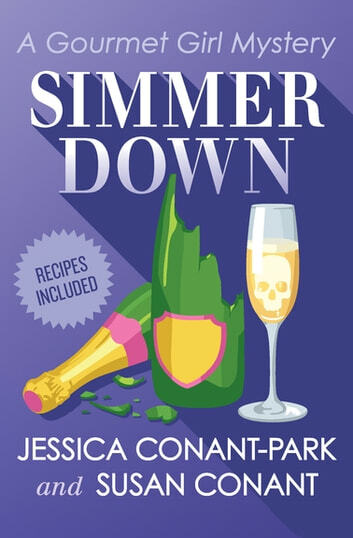 Simmer Down is the 2nd book in the Gourmet Girl Mysteries, but you may enjoy reading the series in any order.